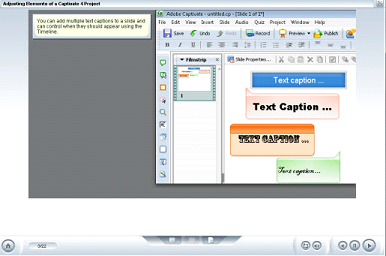 Overview/Description Adobe Captivate 4 is a screen-recording and video capturing application used to create demonstrations, personalized tutorials, simulated environments, and other interactive products. It provides enhanced screen-recording capabilities that allow you to demonstrate procedures while recording mouse movements and text entry, or create fully-functional simulated software environments with supporting feedback. This course focuses on the basics of Adobe Captivate 4, including recording demonstrations and creating interactive assessment settings. Topics focus on such areas as basic screen capture, creating assessment projects, and editing project slides. Our Captivate Training course takes you step by step from the beginner level to the advance level. 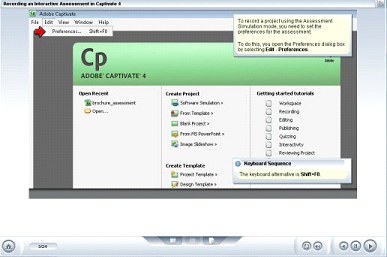 Our Adobe Captivate 4 course targets a broad range of PC end users including designers and developers with a need for creating software simulation demonstrations and assessment projects. Whether you want to improve your skills, projects or resume, our tutorials can help you achieve your goals. Our courses feature hands-on tasks and real-world scenarios — in just a matter of days, you'll be more productive and embracing new technology standards. Our proven method allows you to focus on learning just what you want on your time frame. With our interactive exercises, the actual software is not required to be running on your computer. Review is easy with the ability to do searches and print transcripts of each lesson.